Ariel Anders presented her work on a dental robotics project. Jennifer Roebber is studying the neurological basis of color vision. Jeff Ta and Wilson Liu are developing a standardized sample preparation procedure for next-generation DNA sequencing technology. More than 80 students presented their summer research projects at the 2011 Summer Undergraduate Research Symposium, held on Friday, August 12, in the Baskin Engineering Courtyard. 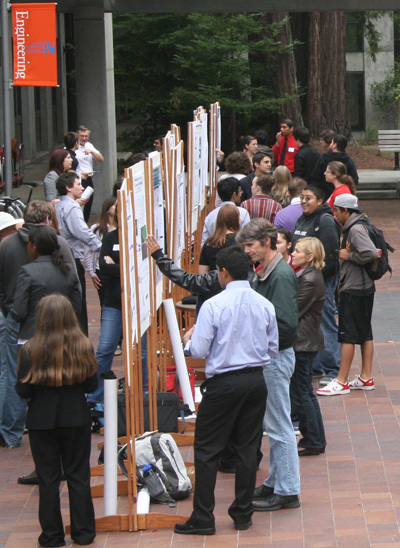 Student researchers explained their work to faculty, staff, and fellow students who gathered around the posters on display in the courtyard. Subjects included solar cells, robotics, gene sequencing, drug discovery, game design, galaxy evolution, and much more. Many of the student researchers are being mentored in campus labs through their participation in programs funded by the National Science Foundation (NSF), National Institutes of Health (NIH), and the University of California. Others began working in faculty labs simply by taking advantage of the wide array of research opportunities available to undergraduates at UC Santa Cruz. 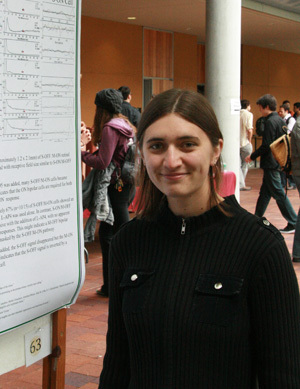 Jennifer Roebber, for example, is a neuroscience major studying the neurological basis of color vision in the cross-disciplinary lab of physicist Alexander (Sasha) Sher. "I just walked into Sasha's office one day and asked him to tell me about his research," Roebber said. "There is so much undergraduate research here, it's one of the wonderful things about this school." Computer engineering major Ariel Anders began her robotics research last summer through an NSF-sponsored summer program (SURF-IT) and has continued it with support from an NIH-sponsored honors program (MARC). Anders is working on a dental robot with medical robotics expert Jacob Rosen, an associate professor of computer engineering in the Baskin School of Engineering. 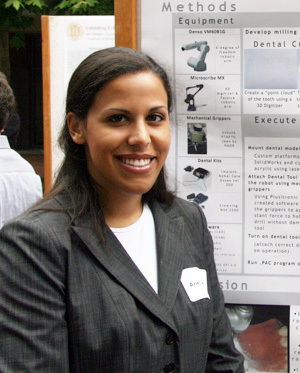 The goal of her project is to develop a robotic arm for use in dental implant procedures. The ACCESS Summer Research Institute is an intensive eight-week program with an emphasis on biomedical sciences that provides internships for students at local community colleges. The California Alliance for Minority Participation (CAMP) supports underrepresented students seeking degrees in science, mathematics, and engineering. The Initiative for Maximizing Student Diversity (IMSD), formally known as the Minority Biomedical Research Support (MBRS) program, is funded through the NIH. The Minority Access to Research Careers (MARC) program is an honors program also funded through the NIH. The Summer Undergraduate Research Fellowship in Information Technology (SURF-IT) is an intensive nine-week summer research program in computer science and engineering, bringing together students from UCSC and other colleges and universities. It is funded by the NSF Research Experiences for Undergraduates program. The UC LEADS (UC Leadership Excellence through Advanced Degrees) program prepares undergraduates to earn Ph.D.s in science, technology, engineering, and mathematics fields. 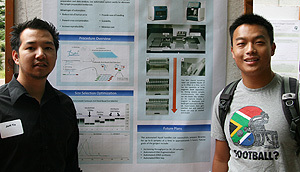 UCSC's Science Internship Program provides research opportunities for high school students.